Our team of three took first place in a three round tourney at our work Christmas Holiday party. Our team tallied the lowest collective score to get past the first round but rallied strong to notch the highest collective score in the second round and went on to win the championship by four pins. 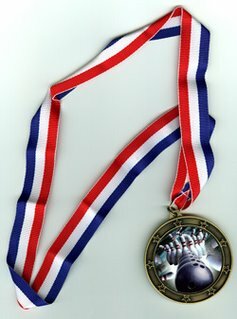 Though victory was sweet there was some disappointment that for all our effort, our 1st place medals looked exactly the same as the 2nd place finishers and the winners of the consolation round.